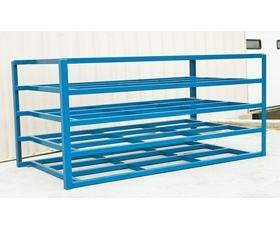 Unit is made with 5 bays to allow for generous spacing of materials with multiple thicknesses. Flat storage reduces the likelihood of warping thin material. All welded steel frame allows for 2000 lb. capacity per shelf storage. 4 sided access when using 4' x 8' sheet or smaller. Unit is supplied with lag down points. FOB Shipping Point. 54-1/2 x 48 x 102-3/4"